The STU-430 is a full-featured, monochrome signature pad with a new thin design and a low-profile, flat surface. 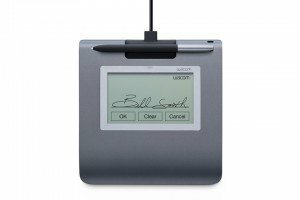 The 4.5’’ screen is large enough to capture longer signatures as well as to accommodate soft buttons in addition to the signature area. The transflective LCD is easily readable in varying light conditions. The STU-430 is a versatile signature pad will all of the features you would expect from a premium product. The thin, attractive design fits in with any signing environment. The monochrome LCD is easily readable in varying light conditions and has enough space for soft buttons in addition to the signature line. State-of-the-art encryption and unique hardware ID ensure secure signing conditions.